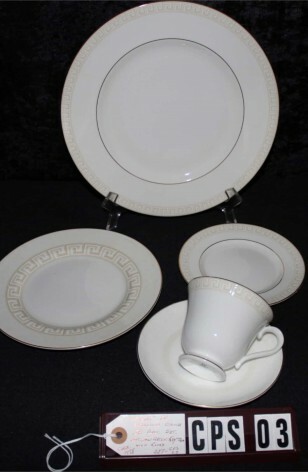 Wedgwood Fine Bone China, Five Piece Place Setting, "Athens" Pattern 501300, Circa 1998-2001. A Lovely 5-Piece Place Setting of Wedgwood Fine Bone China in the "Athens" Pat. #501300. This is a Bone Colored China, with Tan Greek Key Border on the Dinner and Bread Plates as well as the Verges on Saucer, and Accent Plate. All Rims are 22kt Gold Trimmed, 22kt Gold Verges on Dinner and Bread/Butter Plates as well as on the Foot of the Cup. Could be used as a Tea-Trio for One, or a Dramatic 5-Piece Place Setting when having Dinner Alone.. Great Collection Set.. and in great condition. A Lovely 5-Piece Place Setting of Wedgwood Fine Bone China in the "Athens" Pat. #501300. This is a Bone Colored China, with Tan Greek Key Border on the Dinner and Bread Plates as well as the Verges on Saucer, and Accent Plate. All Rims are 22kt Gold Trimmed, 22kt Gold Verges on Dinner and Bread/Butter Plates as well as on the Foot of the Cup. Could be used as a Tea for One, or a Dramatic 5-Piece Place Setting when having Dinner Alone.. Great Collection Set.. and in Very Good Resale Condition unless noted below or in pictures.